Yep, as you may have noticed (or not), this one looks very much like my oekaki "Bird of Prey". 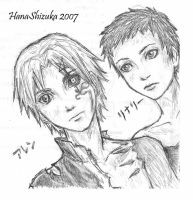 And that's because that oekaki was inspired by this drawing (used the same reference for both of course). Did this as some kind of practice with my paint. Mixed my watercolors with black and white acrylic paint, which gave a really nice result. You can't really see the white paint that well though, because the evil scanner made the paper look white too, while that's actually a bit more yellowish. Ah well. Done on December 27, 2003 (oldie ='3 ). SUPERBE ! I just love it ! "Your paper doesn't have to be filled entirely for your drawing to be finished eh. =3"
yes I am learning that in fact my bird of prey I did I didn't do the rocks he wa sitting on but everyone in class wanted me to leave the other half white and undone. I wish I could draw animals at all. My goodness! That is soooo impressive... u r very talented... the eagle looks so focused - very nice work!